Two short voltage testers with attachment clip and one long voltage tester. Measuring range 220 - 250 V. 3-part. 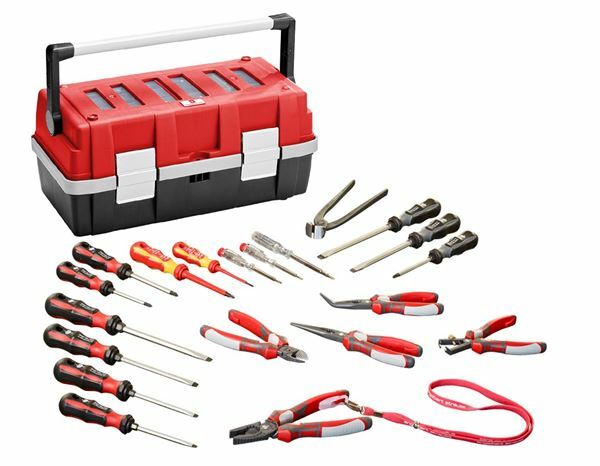 Industrial grade screwdrivers with hex attachment and 2-component handles. Blades made of chrome-vanadium-steel, hardened, blasted and chrome-plated with black tips. Hanging hole in the handle. 6-part in a window box. … is realised by the separate moulding of the blades - it is almost impossible for the handle to twist. … on the handles prevent the screwdriver rolling off the worktop and also offer excellent protection against slipping forward. … for the fast finding of the required size. … allow fatigue-free screwing with optimised force transfer. The special finish of the handle prevents blisters, calluses and joint pain. …weigh less and are resistant to oil and grease. The attached soft zones guarantee ideal force transfer and are gentle on the palms of the hand. 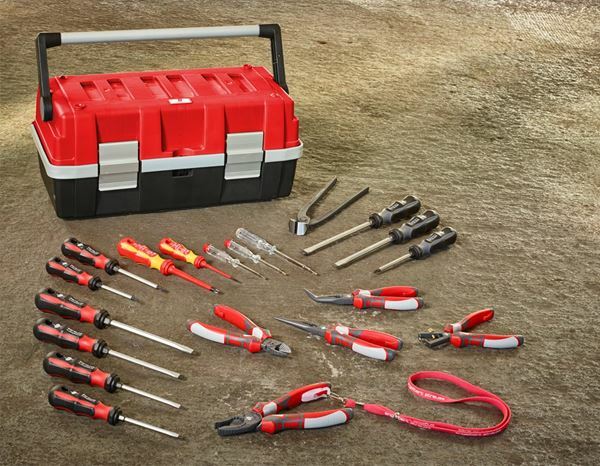 These innovative screwdrivers are manufactured based on the latest ergonomic findings and lengths. The ideal solution for tough everyday conditions. The continuous blade and the special strike plate guarantee optimum force transmission. The e.s. Power screwdrivers "scalpro" are not only suitable for screwing but also chiselling, lifting and releasing stubborn screws. Manufactured and tested to DIN. Safety screwdriver with 2-component handle and blades made of molybdenum-vanadium-steel with insulation. DIN ISO 5749. Optimum cutting geometry guarantees excellent cutting performance. The integrated serrated profile prevents the cable slipping during cutting and causes less crushing thanks to the larger free angle. DIN ISO 5746. Strong material with optimum leverage for easy cutting, with less force. Integrated box wrench (M8–M10). DIN ISO 5745. Long, straight semi-round jaws. Screw for setting to the required strand or wire diameter up to max. Ø 5 mm² or 10 mm² Ø. Opening spring and V-shaped blade. e.s. Lanyard with attachment adapter secures the pliers to prevent them falling. Ideal for use on roofs, scaffolding and on buildings. DIN ISO 9242. Mechanic's nippers made of drop-forged tool steel. Flank painted black, polished head.